Successfully Added USB VAG Commander 5.1 OBDII Diagnostic Cable for VW and Audi to your Shopping Cart. USB VAG Commander 5.1 OBDII Diagnostic Cable for VW, Audi, Seat, and Skoda lets you perform diagnostic work on your car without paying a mechanic. 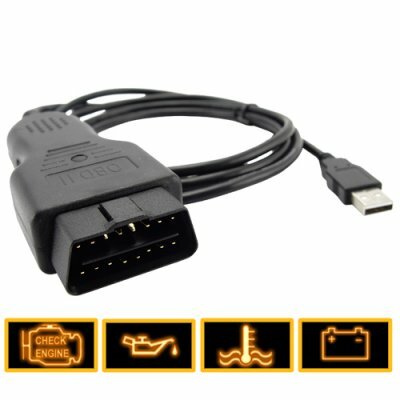 This Commander 5.1 diagnostic cable allows you to connect your car directly to your laptop computer. Using compatible software, you can use this to access data from your car right on your computer screen. You can view live data straight from your vehicle's engine. You will have full access to your car's diagnostic trouble codes (DTC) and see their full definitions as well as the location and type of problem, so you won't have to spend time looking up the code's meaning. You can also clear all generic and some manufacturer specific DTC's. You will also have access to your vehicle's OBDII Freeze Frame data (which is captured when the vehicle's on board computer detects problems). Your local mechanic charges you money for each of those tests, so get this cable and start saving today. Getting started with this diagnostic cable is easy. All you need is this VAG cable, a computer, and a vehicle. No extra converters, connectors, or tools are required. Plug one end of the cable into your vehicle's Diagnostic Link Connector (DLC), which is usually located within easy reach of the driver. Plug the other end into your computer's USB port, and install your favorite diagnostic software. You're now ready to access and interact with your car's on-board computer. Do-it- yourself has never been so simple! NOTE 1: Supports many additional functions. Visit popular DIY car maintenance forums to get an idea about all the great things you can do with a VAG Commander 5.1 cable! NOTE 2: The CVFG-A14 VAG Commander 5.1 cable works on vehicles that's are OBDII/CANBUS compliant as listed above. If you are not sure if this cable type will work with your car model, then check the car user manual, contact your car dealer or talk to your favorite mechanic. Can I use this cable with VAG-CAN Commander or another software called ___________ that my friend recommended? Yes, it should work with VAG-CAN Commander and it may work with other PC diagnostic software, however we do not provide support or recommendations regarding software for this product. Can inspecting my car's data on a regular basis improve my safety? Yes. Did you know that when your vehicle's on board computer detects certain problems, it captures a "Freeze Frame" of the data when the fault was detected, assigns the relevant fault code (DTC), and stores this data in its memory. But it will not turn on a warning light until the same problem is detected on two trips in a row. Using this diagnostic cable, you can access your vehicle's stored data and resolve these problems before they occur again. Don't wait for these problems to happen two times in a row before you get this scanner. Please see the list of compatible vehicles above.